Well I finally got my very own Garand. Back in May I wrote about my mad month of military rifle match participation. One of the matches I shot in was the CMP Western Games match at Camp Pendleton, California. The big clincher in making my decision to drive all the way to California for a rifle match was the opportunity to personally handpick a Garand for purchase from the Civilian Marksmanship Program (CMP). 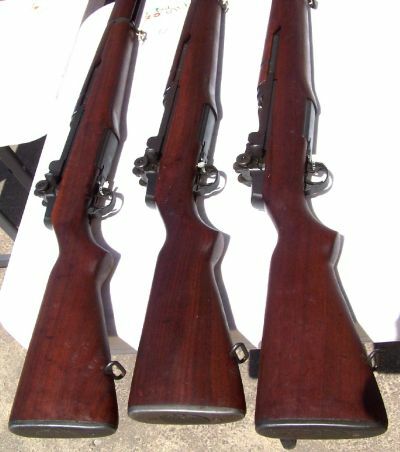 Way back in January of 1999, club member Scott Thompson wrote of his experience with the purchase of an M1 Garand. Things have changed quite a bit with the CMP rifle purchase program since then. Even since June, when my rifle arrived on the doorstep, the program has continued to evolve. Up to very recently, one of the givens when purchasing a CMP Garand was that you had to accept the rifle that was sent to you, sight unseen, luck of the draw. However, you do get to specify the “grade” of rifle you are buying. But in recent times, some limited opportunities to see, pick out, and reserve the rifle that you will buy have been offered by the CMP. These opportunities have been at a few big gun shows across the country, at the CMP retail store in Ohio, at the National Matches, and most recently, at the CMP Western Games. The best bet for most HSC members for fulfilling the CMP affiliated organization membership requirement is to join the Arizona State Rifle & Pistol Association. Dues are only $15 a year. That’s what I did, and I made a photocopy of my membership card. Firearms Owner Identification Cards that included live fire training. Certification from range or club official or law enforcement officer witnessing shooting activity. 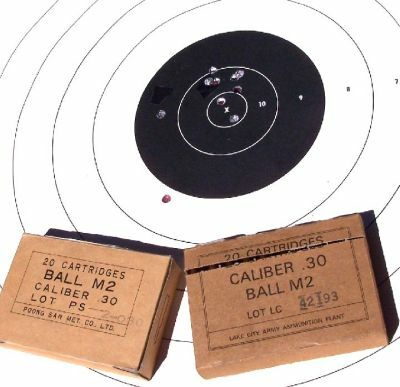 A form for use in completing and certifying your range firing can be downloaded from the CMP web site. As you can see, shooting in one of our club matches is even proof enough of marksmanship activity. No minimum round counts are mentioned. Presumably, printing out the match results from the website would work. Or, a club officer could certify your range work using the CMP form mentioned in the second to the last bullet item above. For me, I made a photocopy of my C&R FFL. The one final hoop you need to jump through is filling out the official CMP purchase form and having it notarized. Availability and prices are always changing, so check the CMP website for current offerings and prices. Rack grade, Field grade, and Service grade guarantee that you will get a mixture of parts from different manufacturers. The differences are mainly in bore condition, though external appearance is also taken into consideration to a lesser degree. Rack grade will show throat erosion of between 5 and 8 on a throat erosion (TE) gauge or the muzzle may gauge over 3 on a muzzle gauge. Field grade guns will show muzzle wear up to 3. Service grade guns will show minimal muzzle wear and gauge less than 5 for throat erosion. It is these Garands that have been returned to the U.S. and are now being sold through the CMP. Most of these rifles are post-war manufacture. It seems that many of these rifles went straight into Greek inventory after being manufactured at either Springfield Armory or Harrington and Richardson. Though I’ve seen some reports of Greek writing scribbled into the wood of a couple of rifles, most of them show no signs that they were ever in Greece. All parts of these Greek returns are U.S. manufactured. This is in contrast to most of the earlier returned rifles from Denmark, which showed a number of Danish and Italian manufactured replacement parts. The CMP Western Games were being held on Saturday and Sunday, May 14th and 15th, 2005. My wife Jodi, my younger son Sam and I made the drive out to California on Friday. My older son Bennet happened to be heading out to Disneyland that same day for an overnight school related field trip. He would have been coming back to Phoenix by school bus on Saturday, but we made arrangements with school officials to pick him up at Disneyland before he was to get on the bus for the trip home. Ben and I would be firing the match on Sunday. at the CMP western Games, May 2005. I had all my CMP purchase paperwork ready and in-hand when I drove through the gates at Camp Pendleton on Saturday morning. I got signed-in for the competition and picked up shooter’s packets for both Ben and myself. Even though you could pick out your rifle at the match, you could not take possession there. After trucking the Garands and other CMP rifles all the way out to California, they would be trucked back to Anniston, Alabama, from where they would be shipped to their new owners on the west coast. Don’t ask me what sense that makes! I was in the market for a Service grade Garand. At the time, CMP was offering both Springfield Armory (SA) and Harrington & Richardson (HRA) Greek Garands in Service grade. The SAs were $500, and the HRAs were selling for $550. I had not quite made up my mind about which I preferred. A total of only about 446,600 HRAs were ever manufactured, about 8% of total M1 production. So while desirable from a collector’s viewpoint, my basic desire was for a good shooter for John C. Garand Match competition. 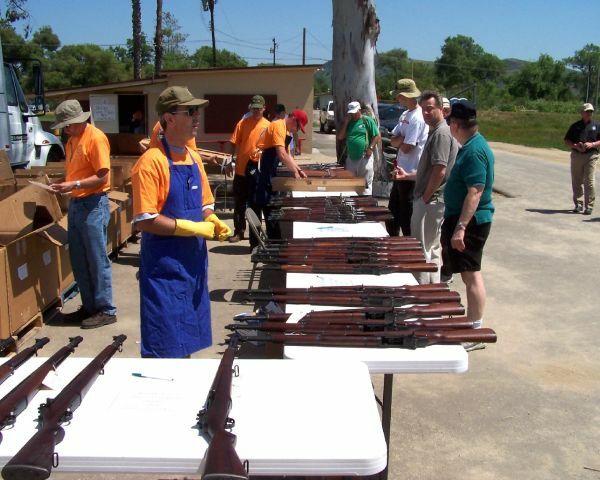 CMP personnel had set up a number of folding banquet tables on which they would lay out their rifles for purchase selection. They taped down sheets of paper in various areas describing the guns and prices. The choice was made for me when I saw that they had taped down a sheet of paper for HRA Service grade rifles, but not one for SA Service grade rifles. The only Service grade rifles they had brought out with them were a relatively small number of HRAs. However, they would not actually lay out any of the rifles until after the day’s shooters finished their match. They wanted to give everyone the same chance at rifle selection. A trio of Collector grade Garands. The problem was, as the day got later and later, the time to pick Ben up at Disneyland got closer and closer – and still the shooting went on and on. Finally at 2:00, I walked up to the table and told them that I soon had to leave, can I please pick out my rifle now? “No, sorry, we have to wait until the shooters finish.” Not what I wanted to hear. I waited another 20 minutes and still the shooting kept going. I finally had to give it one more try as I was really up against a hard stop as far as time was concerned. I showed them that my papers were in-hand, ready to go. I was a serious buyer ready to make a choice. Then I explained that I was shooting tomorrow and I could come back the next day to pick out my rifle. “But will any Service grade rifles be left tomorrow?” The man looked at me, pondered his response for a moment, then had to admit that they would probably be all spoken for today. “I’ll tell you what. I’ll let you go up to the boxes and pick out one of the four in the top layer. Would that be alright?” The rifles were trucked to the event in large boxes, four to a layer, I think five layers deep. You betcha that would be alright! So he led me to the box of Service grade HRAs. Of the four in the top layer, one had a scabby-looking stock which I rejected immediately. Another one had an OK stock, but the other two looked really good. Close examination of the best looking of those two revealed a dark line in the buttstock. I wasn’t so sure, so I rejected that one, leaving my final pick. So that’s how I got first choice of Garands at the CMP Western Games! I then had to fill out a couple of hang tags – one with my name and phone number to be affixed to the rifle, and one with the rifle’s serial number that I was supposed to hang on to. Then he told me exactly what to write down on the CMP order form, including CAMP PENDLETON in big bold letters to make sure that the order-fillers would be alerted to send me my hand pick rifle, not just any old one. I thought that I could hand in my paperwork to them on the spot, but they told me that I still had to send it all in, through the U.S. mail, to the sales people in Anniston. A month later it arrived on my doorstep via Federal Express. While I waited for it to arrive, I did a serial number lookup on it to determine year of manufacture. My rifle was made in 1955. Also while waiting, I had ordered some Garand knick-knacks from Fulton Armory. CMP ships the rifle with one eight round clip, but that’s not enough, is it? So I ordered a ten-pack of eight rounders, a five round clip should I ever get a notion to hunt with the darn thing, plus a two round clip and a one round clip for competition. Since a Garand must be cleaned from the muzzle, I also ordered a muzzle end cleaning rod guide. At the Prescott vintage rifle match, I was able to buy some Lake City M2 Ball ammunition, the Garand’s favorite fodder, but I also placed an order with Sportsman’s Guide for some Korean M2 Ball at a good price. Shortly after the Garand’s arrival I got an opportunity to shoot it for the first time up in the cool pines near Flagstaff. As a Garand newbee, this was basically a familiarization session. How do you load it? How do you unload it? How does the one-round clip work? How do the sight adjustments work? Can I avoid the notorious “M1 Thumb” condition? And most importantly, how does it shoot? First shots out of my new 50-year-old Garand. I set up an SR-1 target about 85 yards downrange from my portable shooting bench. I loaded up the five round clip with 5 rounds of Lake City and pumped them downrange. Then I loaded 5 rounds of the Korean Poong San M2 Ball into the five rounder and pumped those down range. This was bench rested, but with iron sights. When I walked downrange to look at the target, I was quite delighted by what I saw. Only one round escaped from the black. Eight of the shots were tens, three of those Xs! The two different loads did not form two separate groups. Super! In the rapid fire stage in competition, you need to fire two rounds, reload on the clock, then fire eight more for a total of ten shots. While many folks have learned the trick of loading just two rounds in a standard eight round clip, I thought it would be easier to have a dedicated two round clip for this purpose. A one round clip is handy in the slow fire stages where you must load only one round into the rifle at a time. Someone coined a fancy acronym for the one round clip: S.L.E.D. for Single Load Enhancement Device. Instead of flying out of the rifle after the shot is fired, the SLED remains in the rifle when the bolt locks open. The advantage over loading one round at a time with no clip in the rifle, is that the SLED allows the bolt to strip a round from the magazine as it was designed to do, thus reducing bolt velocity as the bolt slams into battery, easing wear on the mechanicals. I’ll tell you shortly why its not a good thing to simply ease the bolt forward on a chambered round. During my familiarization session in the forest, I could not get the SLED to stay put in the rifle after firing the one shot. Just like a standard clip, it would come flying out after the shot. I later figured out that I was snapping the round into the wrong side of the double column magazine. 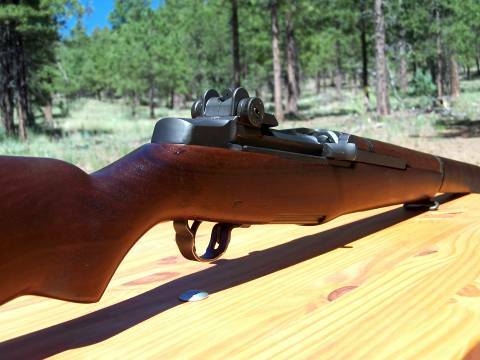 The Prescott Sportsmen’s Club had a John C. Garand match scheduled for August 28th. I was planning to make this match my first with the new rifle. At a John C. Garand match, the rifles must be as-issued, so the steely-eyed experienced shooters have to leave their high-dollar, highly-tuned and bedded match Garands at home. I was shooting pretty good. We had just finished the 20 rounds of slow fire prone, and now it was time for the prone rapid fire stage. When the signal was given to start firing, I lined up my sights and the gun said >CLICK<. You only have 70 seconds to fire your ten rounds. I jacked open the action and saw one round in the chamber, the second round with it’s FMJ point directly behind the chambered round’s primer, in front of the bolt ready to be stripped forward. OK, I had not practiced emergency clearing procedures with the Garand! While holding the bolt back under spring pressure with one hand, I reached for my ever-present pocket knife on my belt pouch. Using the screwdriver blade, I pried at round number two, trying to get it to pop out of the magazine. As time clicked away, I realized that I was hosed, and gave up hope that I was going to get off any shots. So I calmed down and eventually cleared the gun just as time expired. A big fat goose egg for rapid fire prone! It was because I had eased the bolt forward in chambering the first round, that the bolt had not gone fully forward into battery, hence the click and not a bang. I finished the match with a score of 350 out of 500. The good news was that I still wasn’t the lowest score!